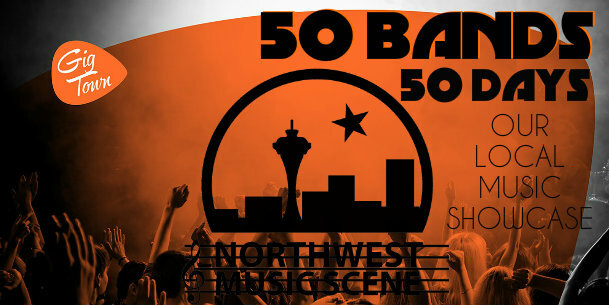 Ladies and gentlemen, welcome to the first outing of 50 Bands in 50 Days, our yearly showcase of the best talent coming out of the Pacific Northwest, brought to you by GigTown! We thought we’d kick things off with a bang this year by setting our sights on one of the most electrifying rock bands coming out of Seattle, one Klover Jane. Born out of the group’s collective love for the heaviest-hitters in American rock and roll, Klover Jane use the combined talents of their five members to create a dynamic that feels as indebted to Guns N’ Roses as it does Mother Love Bone, with maybe a bit owed to more modern names in hard rock like Staind and Rise Against. With a sound equally bar- and arena-friendly, Klover Jane has justly risen up the food chain as a local band of seasoned rockers to really watch out for. The group has worked with ex-local darling Dudley Taft, who produced their first couple EPs, and is currently ready to drop a new level of badass music soon with a great new album. Fans of old and new hard rock alike that aren’t already familiar with Klover Jane’s back catalogue owes it to themselves to check them out immediately. A Klover Jane live show has always been a thrill ride and from the first song to the last, they deliver blow after blow to until they have sufficiently melted some faces. Frontman Rane Stone’s trademark delivery and inflection, which sounds instantly recognizable when compared to other hard rock bands from their neck of the woods, possesses one of the more power voices in the game. Whether it’s a the seriously addicting grove rocker “Tattoo’d Kandy” or the kickass anthem “Long, Long Ride” there’s a whole lot to like about this band. You can follow Klover Jane on Facebook and Twitter, and listen to their music via their ReverbNation page.